Mesothelioma patients being treated with intravenous chemotherapy likely will be helped in cost and availability by President Barack Obama’s executive order this week that is designed to ease a growing number of vital-drug shortages. The order not only offers help for drug manufacturers and wholesalers, but it also strengthens efforts by the FDA to prevent and resolve shortages that have cut into the treatment of various cancers, including mesothelioma. There are 84 drugs listed on the FDA’s latest Current Drug Shortages List, including Cisplatin, which is part of the Standard Care treatment used by oncologists for mesothelioma patients. Alimta (whose generic is pemetrexed), the other most commonly-used chemotherapy drug, is not on the Shortages List, but its high cost (estimated $1,700 per vial) could be reduced once the Executive Order takes hold. 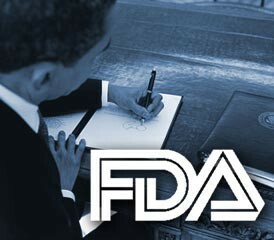 This the first time since 1985 that a president issued an executive order that affects the function of the FDA. According to the FDA’s list, the shortage of Cisplatin stems to increased demand, manufacturing delays, and the product discontinuation by one of the manufacturers. Mesothelioma is a rare cancer — caused by an exposure to asbestos — diagnosed in an estimated 2,000 to 3,000 Americans annually. Obama’s Order directs the FDA to require companies to provide more advanced notice when they plan to discontinue manufacturing a drug, or even report any potential disruptions in the flow to market. The Order will allow the FDA to expedite its review of a manufacturer’s vital-drug application, and provide information sooner to the Justice Department regarding price gouging, or collusion. Some of the same measures, but come with large civil fines for non-compliance, are included in proposed legislation that has been pending in Congress for months but is bogged down by partisan bickering. The shortages of some drugs and the high prices of others, have delayed much-needed clinical trials and forced some patients to take medicines that may not be as effective. The demand for generic cancer drugs also has increased rapidly, leaving manufacturers unable to satisfy everyone. Obama administration officials have described the order as a first step to solving a complex problem, admitting that more measures will be needed. The administration, according to the New York Times, is considering the creation of a government stockpile of crucial cancer-treating medicines. The most critical shortages today involve various chemotherapy drugs, drugs for surgical patients and antibiotics for infections. According to the Times article, nearly half of the drug shortages followed government inspections that found serious quality-control problems. As part of the order, the FDA is expected to increase the staff devoted to alleviating the drug shortages.